Nearly 1,800 people were arrested Saturday across France in the latest round of “yellow vest” protests. 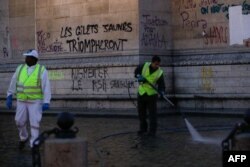 Nationwide, the Interior Ministry says some 136,000 people rallied against France’s high-cost of living. Protesters also expressed their dismay with the presidency of Emmanuel Macron. Protests were mounted in a number of cities besides Paris, including Marseilles, Bordeaux, Lyon and Toulouse. The ministry said Sunday 1,723 people were arrested nationwide, with 1,220 of them ordered held in custody. Parisian police said they made 1,082 arrests Saturday, a sharp increase from last week’s 412 arrests. 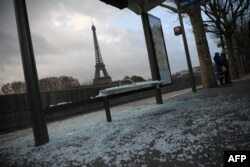 Meanwhile, tourist destinations, including the Eiffel Tower and the Louvre Museum, reopened and workers cleaned up broken glass Sunday. French police supported by armored vehicles fired tear gas at yellow-vested protesters on the Champs Elysees. Castaner estimated 10,000 demonstrators had taken to Parisian streets. He said 135 people had been injured, including 17 police officers. 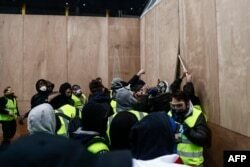 Protesters wearing yellow vests remove wooden boards protecting a shop windows during a demonstration against the rising costs of living that they blame on high taxes in Paris, Dec. 8, 2018. Despite what Castaner said were “exceptional” security measures, protesters still smashed store windows and clashed with police. More than 89,000 police were deployed nationwide, an increase from 65,000 last weekend. Police in central Paris removed any materials from the streets that could be used as weapons or projectiles during the demonstrations, including street furniture at outdoor cafes. Macron made an unannounced visit Friday night to a group of anti-riot security officers outside Paris to thank them for their work. The protests erupted in November over a fuel tax increase, which was part of Macron’s plan to combat global warming. French Prime Minister Edouard Philippe called for new talks Saturday with representatives of the “yellow vest” movement. He vowed the government would address their concerns over rising living costs. “The president will speak, and will propose measures that will feed this dialogue,” Philippe said in a televised statement. Government officials are concerned the repeated weekly violence could weaken the economy and raise doubts about the government’s survival. Officials are also concerned about far-right, anarchist and anti-capitalist groups like Black Bloc that have attached themselves to the “yellow vest” movement.